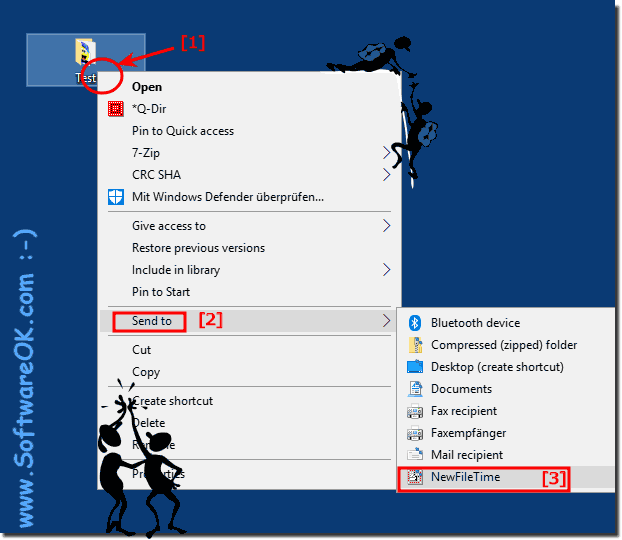 Change File and Folder time via MS Explorer Menu! You can also add NFT to the MS Explorer context menu to make it even easier to change file and folder times! 1.) ... Add Files via Explorer Right Click! 2.) ... Bug Fix Unicode Char! See also: ► when drag drop are not all files and folders added to the list? 1.) Add Files via Explorer Right Click! Tip: you can also call this in the file manager Q-Dir . (Image-1) About MS Explorer Menu change File and Folder time! (Image-2) Change File and Folder time via MS Explorer Menu! As you can see above in Windows 10 shot screenshot, it is now even easier to change file and folder times, you can use this file and folder times change function as a solution and easily on earlier versions of Microsoft's Windows operating systems to change timestamp of directories, files and folders. Use this file and folder times change tool, no matter if it is a Windows desktop System on your home PC, or to go on the tablet PC and MS Surface Pro or Go, as well as on the business server operating system at government and commercial. 2.) Bug Fix Unicode Char! I checked it out but there was no write protection. But I found out that the files which have special letters(some chinese, vietnamese, thailands, etc) in the file names weren't be able to change the dates. When I deleted or changed those letters in the file names your program worked great again. But I have too many files with those letters to modify manually. Is there any chance to fix this problem easily? NewFileTime - FAQ-11: Change File and Folder time via MS Explorer Menu!